Gov. 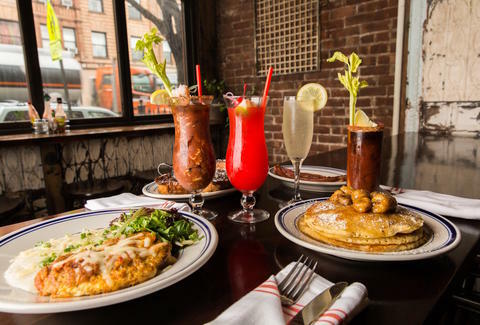 Cuomo signed the "brunch bill" into law on Wednesday, September 7th, meaning your boozy brunch can finally begin as early as 10am this weekend -- September 10th and September 11th, according to a report by Grub Street. Finally. If there's one occasion when everyone can agree that it's perfectly reasonable to start drinking before noon, it's almost certainly brunch. And yet, New York has long prohibited restaurants and bars across the state from selling alcohol before noon on Sundays -- that is, until now. Yes, that's right: booze, before noon, on Sundays. Finally. Gov. Andrew Cuomo announced Tuesday that state lawmakers have agreed to a deal that finally allows restaurants and bars to start serving alcohol at 10am on Sundays, one of several new reforms aimed at modernizing New York’s 80-year-old, buzz-killing Alcoholic Beverage Control Law. The new policy could take effect as early as this weekend, according to a report by The New York Post. In other words, you get two additional hours of drinking on Sundays, and well, your boozy Sunday Fundays will never be the same. "We've worked hard to cut red tape, lower costs and roll back burdensome regulations to help New York's craft beverage industry thrive and create jobs, as well as some of the best beer, wine, cider and distilled spirits in the world," Cuomo said in a press release. "This agreement to overhaul this state's archaic blue laws will build upon these ongoing efforts by knocking down artificial barriers for restaurants and small businesses and helping this industry grow even stronger." But don't start pouring celebratory screwdrivers just yet. As it turns out, bars and restaurants outside of New York City will also be able to apply for permits -- up to 12 per year -- to start serving alcohol as early as 8am on Sundays under the new policy. Apparently, the brunch lobby failed to persuade city community boards concerned about early morning alcohol-fueled noise on the streets. But then again, 10am is much better than noon. Anyway, it's probably safe to say the governor will be receiving brunch invitations in the near future. And as always, friends, brunch responsibly. Tony Merevick is Cities News Editor at Thrillist and thinks this would be the BEST news... if he didn't have to work on Sundays. Send news tips to news@thrillist.com and follow him on Twitter @tonymerevick.